It’s that time again! Every month throughout the year, My Family Guide will choose a local business who deserve recognition for being family friendly, or who may go out of the way to accommodate families. The first business of 2016 is none other than Vancouver’s very own, Heathen Brewing Feral Public House! If you don’t know, I’m a big fan of locally made craft beer. Not only is the beer so much better than the domestic guys (insert bitter beer face), but it’s a great way to support other small businesses in the community. You really feel that you’re part of their success as you watch them grow, and Heathen Brewing is no exception. I was first introduced to Heathen a couple of years ago at the 1st annual Vancouver Brewfest. There were quite a few local brewers at the venue, and my Dad and I were chatting with them the lot of them. Heathen happened to be at one of the beer booths my Dad and I kept coming back to. The beer was excellent, and the gentlemen working the booth were also very interactive with us. We got to hear about how Heathen Brewer, Sunny Parsons, started brewing in his garage and slowly made a name for himself in the area as a top local brewer. He talked about some of the success’s he experienced, as well as some of the failure’s. Fast forward three years later and Heathen Brewing has their first Public House, a pulse on the local community, and a bright future. My interview with General Manager, Keno Leighty, confirmed that Heathen Brewing isn’t just about making fantastic beer and food, while also being a successful business and giving back to the community. All that shows as soon as you walk into The Feral Public House. Located in downtown Vancouver, WA, the The Feral Public House is a great place for anyone looking for a good time out with family and friends. The locally painted art work gives the Feral House a welcoming and unique feel. With 31 taps onsite, Feral House is a perfect spot for craft beer lovers. They also have wine, Kombucha and my daughters favorite treat, Root Beer. Not to take away from the beverage selection, but the food at the Feral House is also a centerpiece. From the Dive-In-Burger to the Knotty-Goo, or the Feral Poutine, eating these delicious dishes, feels like a sin. 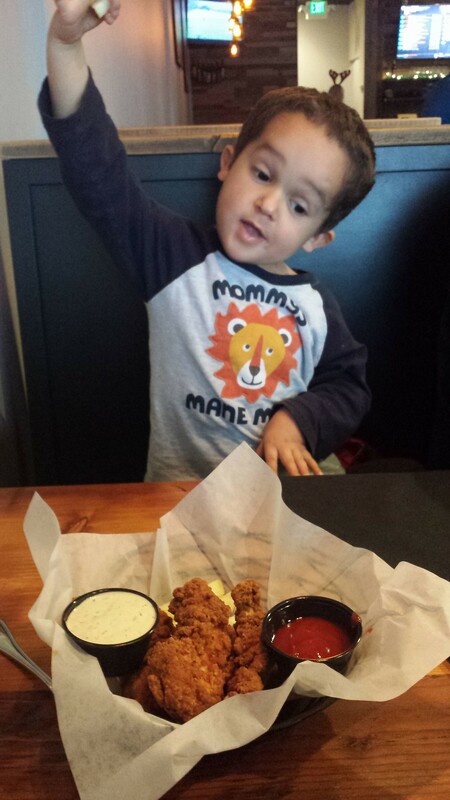 Let’s not forget my son’s personal favorite from the Little Heathens Menu, The Chicken Strips! However, like I said before, Heathen Brewing isn’t just about making great beer and food, but also giving back to the community. When talking with General Manager Keno, he stressed how important it is for small business owners to be a fixture in the community and giving back. Some of the organizations Feral House donates to are, Hough Elementary, Share House and Colombia Springs. They’ve also provided catering for Hoop Fest and will provide catering for the upcoming Recycle Festival in June. Looking for a venue for your child’s birthday or graduation? Look no further. The Feral House accommodates private parties, and events. Speaking of special events, the Feral House always has something brewing on their calendar, such as Paintnite, Football Sunday’s and Beer Release Night! Click here for a full list of events. Yes, Sir! The future is definitely bright for Heathen Brewing and the Feral House. Don’t be surprised if you see them expand their business throughout the entire Vancouver Area, Portland, Pacific Northwest, The Nation and The World! Heck, they were one of the first Micro Brews in the area to ship beer to Norway, and have it sold out! I’m going to close here, because I know those pictures are probably making you hungry. If you and your family find yourselves in the downtown Vancouver area, I strongly suggest you visit Heathen Brewery Feral Public House. And for My Family Guide Members, The guys at Feral House have a special discount.